I have always been fond of red foxes. They live around the world in many diverse habitats including forests, grasslands, mountains, and deserts. , They are present across the entire Northern Hemisphere from the Arctic Circle to North Africa, North America and Eurasia. They adapt well to human environments such as farms, suburban areas, and even large communities. The red fox's resourcefulness has earned it a legendary reputation for intelligence and cunning. The species has a long history of association with humans, having been extensively hunted as a pest and furbearer for many centuries, as well as being represented in human folklore and mythology. "Brer Fox Tackles Brer Tarrypin", from Uncle Remus, His Songs and His Sayings: The Folk-Lore of the Old Plantation, by Joel Chandler Harris, p. 60a. Illustrations by Frederick S. Church and James H. Moser. New York: D. Appleton and Company, 1881. 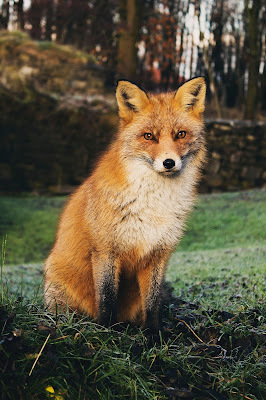 My experience with the red fox began in my childhood with folklore that I read and had read to me. In folklore, foxes are typically characterized as cunning creatures sometimes having magical powers. 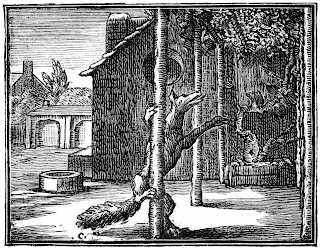 The fox is also sometimes associated with transformation. 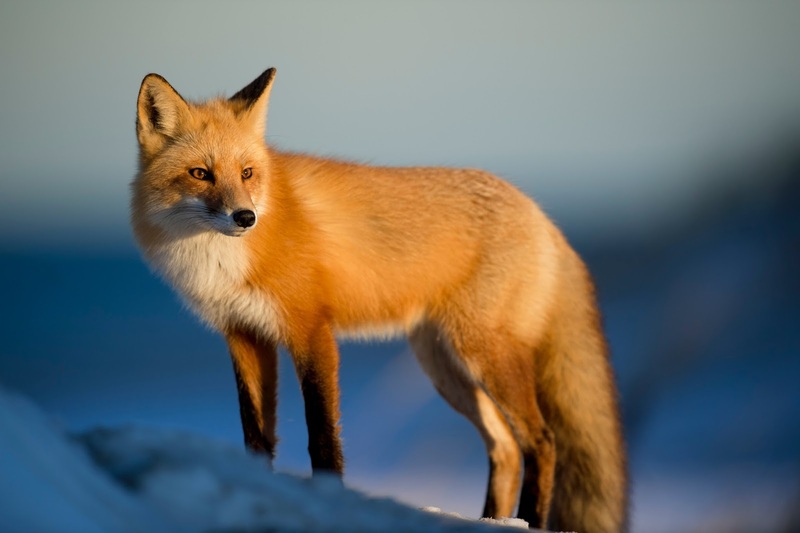 In Europe, in the Middle Ages and Renaissance, foxes, which were associated with fraudulent behavior. They were sometimes burned as symbols of the Devil. The term "foxy" in English ("having the qualities of a fox") can also connote attractiveness, sexiness or being red-haired. The term to "outfox" means "to beat in a competition of wits". 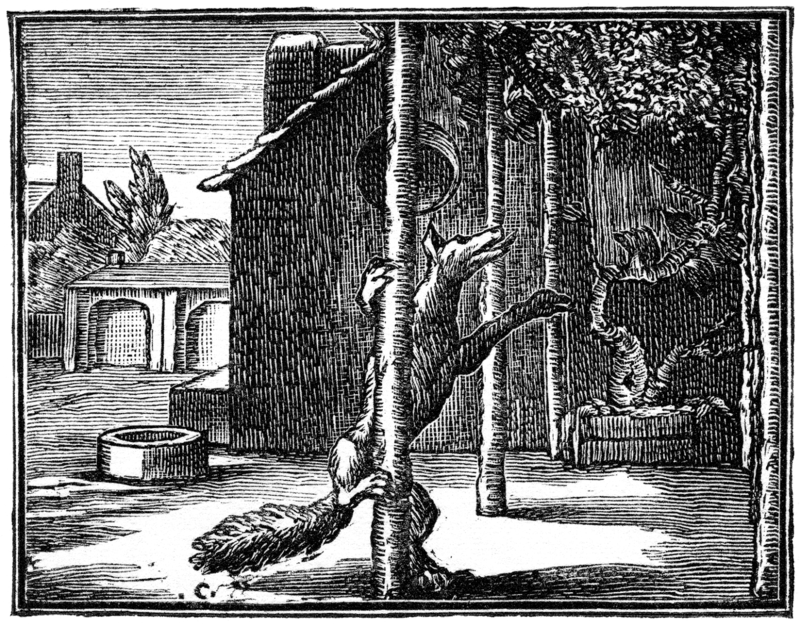 In elementary school I was exposed to Aesop's fables from 4 BC. A fox is featured famously in The Fox and the Grapes. The story concerns a fox that tries to eat grapes from a vine but cannot reach them. Rather than admit defeat, he states they are undesirable. The expression "sour grapes" originated from this fable. 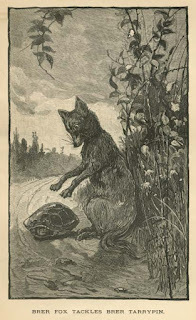 As a child I read Uncle Remus which is collection of 19th-century African-American folktales adapted and compiled by Joel Chandler Harris, "Br'er Fox" is a major character, often acting as the antagonist towards the stories' main character, "Br'er Rabbit". As a teen I enjoyed the animated Disney movie The Fox and the Hound which stars a fox named Tod as one of the two protagonists. Perhaps my love of the fox began with the stories that I read as a child. Before retiring to make jewelry, I was a children's librarian and my exposure to foxes in literature grew. Now, I find myself using the fox as a element in my jewelry. 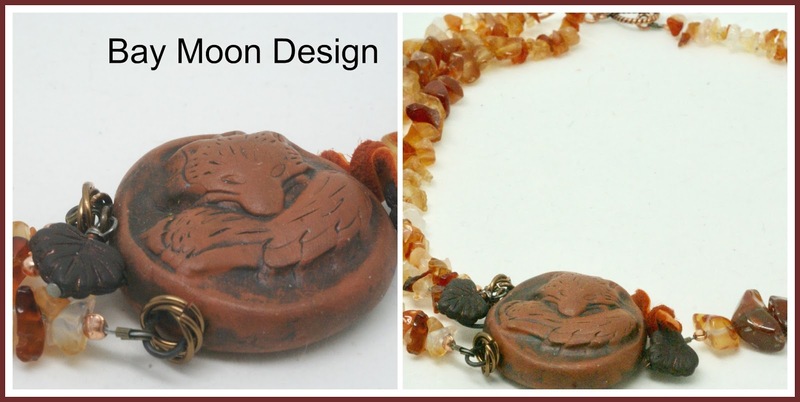 Currently, in my BayMoonDesign shop you will find this fox necklace. The necklace is new and in my autumn collection. The reddish brown fox is surrounded by a few charcoal gray Czech glass leaves and a bit of orange deer hide leather. Those colors along with the quartz chips are favorite fall colors for me. The necklace has multi strands. There are 3 strands on one side and 1 strand on the other. It is a choker necklace and is only 19 inches around. The beautiful polymer clay fox pendant created by artisan Brooke Brock. It is one of a kind and is available for purchase. 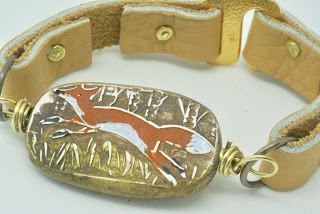 Another example of my using the red fox is this fox bracelet. This animal bracelet was tan leather straps and is held together with a brass clasp. The leather fox cuff bracelet fits a 7 inch wrist. The fox art bead is by artisan Humblebeads. It is a favorite bead of mine to order for bracelets. Do you have an favorite fox memories that you would like to share? I would love to hear them. The August We're All Ears Challenge focuses on moths. We can create a pair of earrings that is inspired by their the colors, the patterns, the shapes of moths. I had no idea that there are far more moth species in the U.S. than birds (914 bird species to be exact). Also, It amazes me the variety of colors in which they are found. Looking at the colors above, I decided that I would make some earrings inspired by orange and brown. I am working on my fall line of jewelry now and those are perfect fall color in my mind. 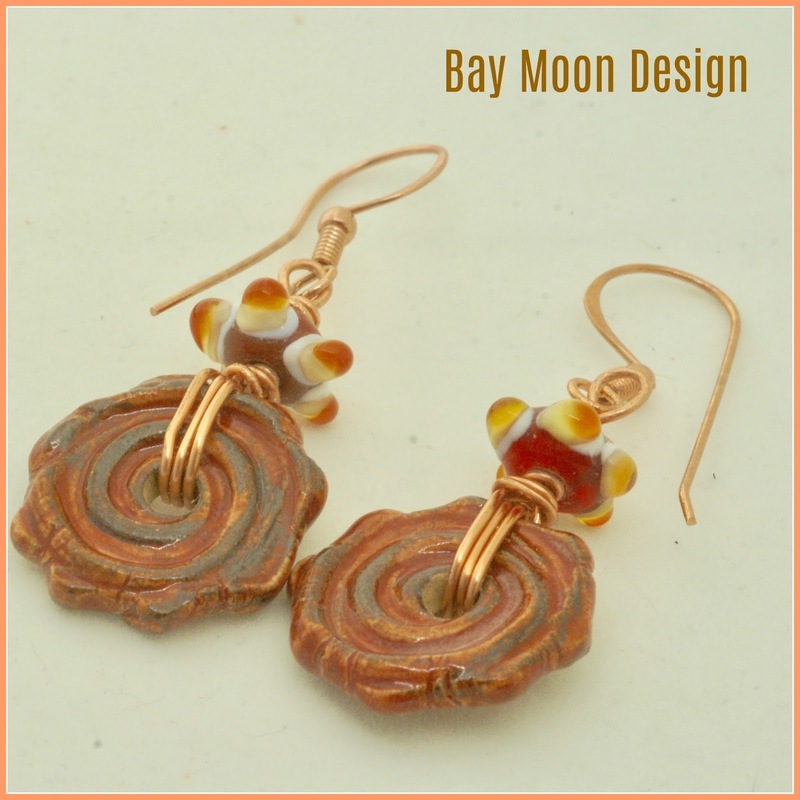 These burnt orange ceramic earrings have the orange and browns of some moth. These are textured ceramic earrings that dangle below an orange and yellow bead. I thought that the orange and yellow bead was perfect for the earrings because many of the moths have all 3 colors and I like those 3 colors together. Copper is used in the ear wires and to wrap around the ceramics. I love how the burnt orange color of the ceramics looks with copper. These rustic earrings are 2 inches and are light and comfortable to wear. The artisan ceramics are made by Marsha Neal Studio. The earrings are available for purchase HERE. 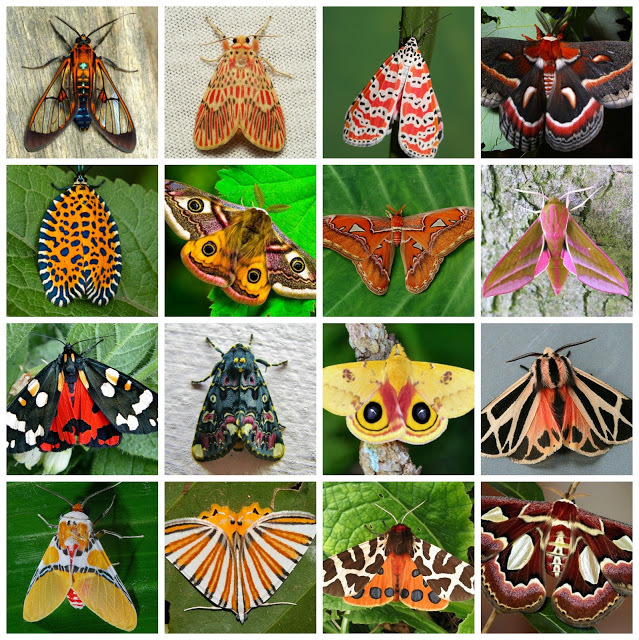 What colors of moths inspire you? Twelve Princesses on the Way to the Dance by Kay Nieslen is a watercolor and ink that I love and it is August's Art Bead Scene Challenge inspiration piece. 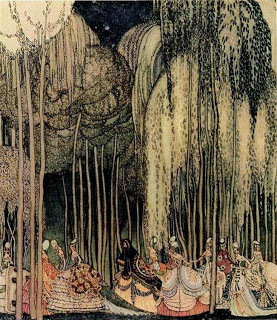 There are so many different elements to focus on in it First and foremost being a retired children's librarian, I am fascinated by how this work delves into the realms of fairy tales. "Will you pull from the opulent patterns of the dresses? 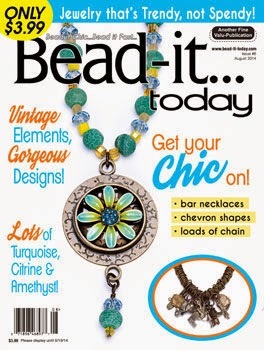 Play with silk ribbon and floral beads inspired by the Princesses? Will you explore the repetitive elements of the tall trees using wire or gather beads mimicking the branches and leaves cascading down from the forest canopy? Will you mix the dark tones of black and grey with the pastel tones of peach, coral, lavender, greens and warm cream hues?" I focused on the tall trees. I noticed the contrast in shades of dark and light. I selected the dark tones of brown, black, and gray and contrasted them with warm tones of green, cream, golden yellow. 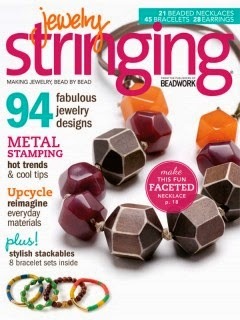 I also mimicked the straight lines of the trees by using agate spike beads. I love the creamy ceramic leaf shaped ceramics. Unfortunately, these art beads had been hoarded so long that the artisan who make them is no longer with us. I used the largest of the leaves as the focal. 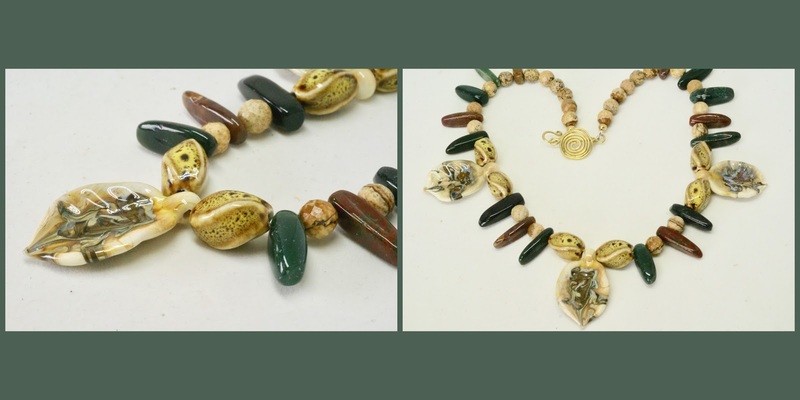 Moss green and brown agate spikes in addition to round light brown jasper beads are found in this necklace. 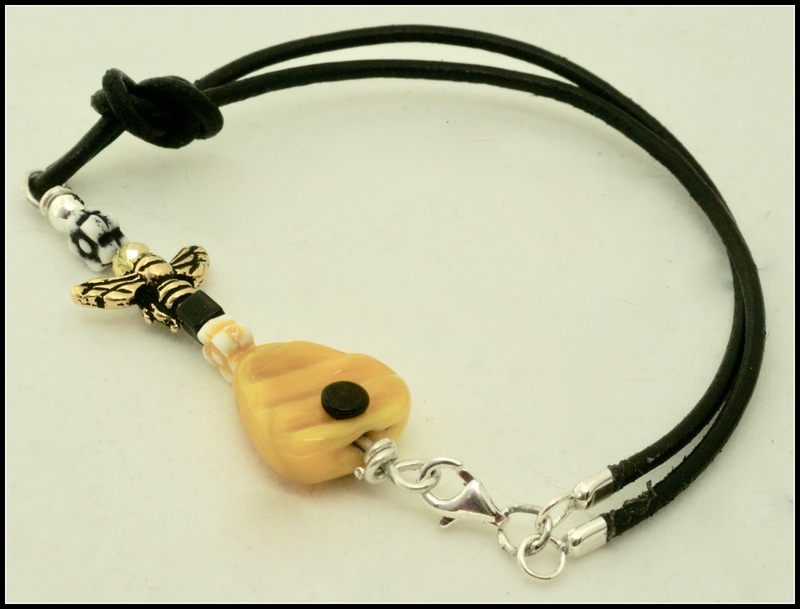 I had some creamy yellow ceramic beads that I added to lighten up the necklace. I made the brass clasp which reminds me of the sun. This necklace is 18 inches around. I am happy to say that this necklace sold already. It was one of those sales that you know you are going to make from the first moment you spot the customer. I watched the woman smile and walk to the necklace. She immediately put it on, admired it in the mirror, and bought it. I could tell it was going to a loving home so I smiled too. 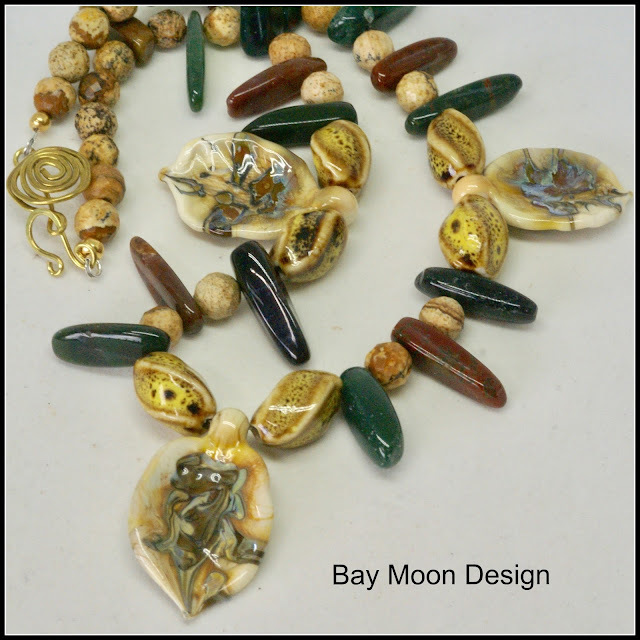 I have many other pieces of jewelry for sale in my BayMoonDesign store. Stop by for a look! 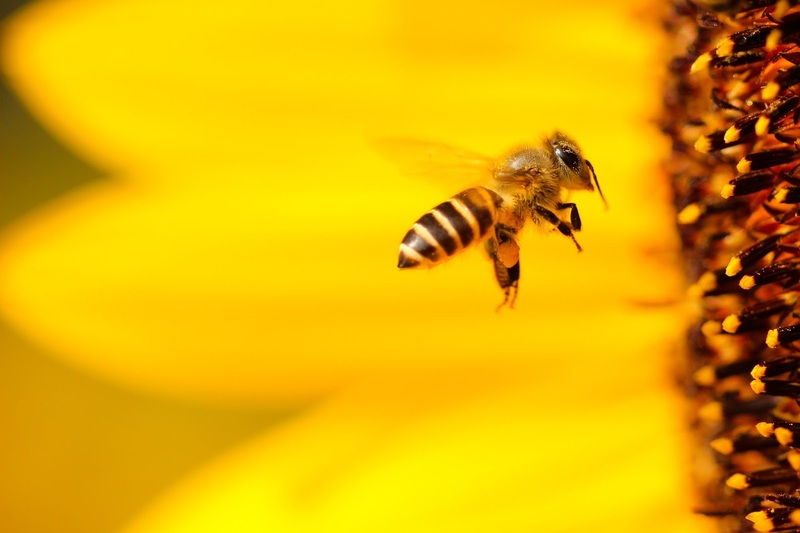 Bees are considered extremely auspicious throughout the world. They have played an important part in symbolism since Ancient times. 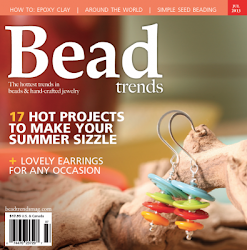 I have been collecting bee beads and using them in my jewelry because of their symbolism. The list of virtues of the bee is very long. They have been considered to be messengers carrying news to the spirit world in many cultures. Bees represent wisdom and immortality. Bees symbolize love and also fidelity. They represent productivity and industry. They produce beeswax and honey which are golden. Gold and the golden color have always been related to wealth. Bees were believed to have knowledge of the future and secret matters. I did some research on fall trends for 2017 to get some ideas on what to add to my jewelry collection. I found that leather jewelry is going to be popular once again. I decided to go with the leather trend and make some leather bracelets. 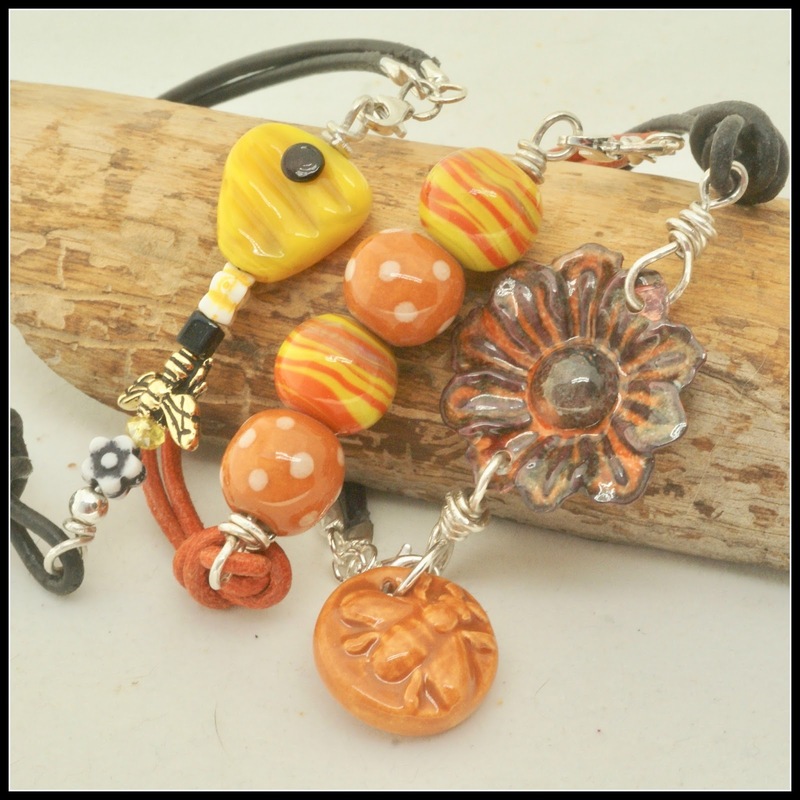 I wanted a set of bracelet that can be worn separately or together. To be worn together, a theme and color scheme is needed. I decided to go with the theme of bees. Bees are the true source of very positive symbolism. 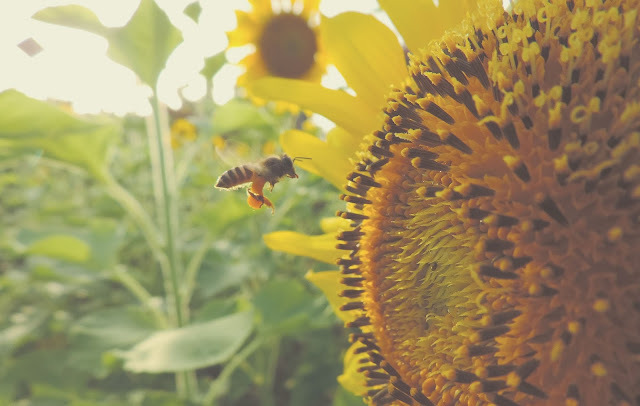 Bees represents such fine moral qualities as hard work, diligence, wisdom, spirituality, humility, modesty, communication as well as physical and spiritual cleanliness. Bumblebees are considered to be beneficial insects because they pollinate crops and plants. 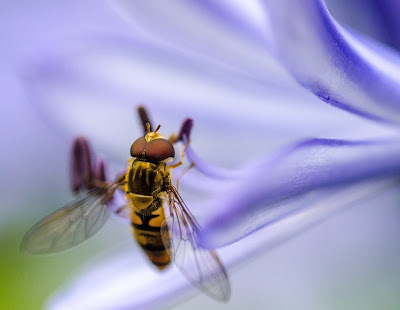 The tiny bee is essential for our very existence. I also decided to go with a yellow, orange, and black color scheme. These are great colors for the fall. They also works with the beads that I decided to use. First, I created beaded connectors, which requires some simple wire-wrapping. About 3 inches down along the wire, bend it slightly to the left, then wrap it over the right side of your round pliers, forming a loop. Then, take the tail end and wrap it a couple times around the main part of the wire. Cut off the excess tail with wire cutters. Add your beads, and repeat the process to form a loop on the other side. A few mm from the bead, create a loop, and wrap it around the main part of the wire until it fills the space between the loop and bead. Trim off the excess wire. My connectors are about 1.75 inches long, which is a good size for a bracelet. I wouldn’t go any longer than 2 inches. I spent some time looking at various leathers and I decided to go with 2mm leather cord because I wanted the leather cord substantial enough for a bracelet yet not too bulky when worn with other bracelets. I tried a new company to me Plessmann Endless Leather. It is located in Germany. They are a supplier with the largest choice of leather cords and leather laces worldwide. They have more than 2000 different leather cords at wholesale prices online. Braided bola cords, finest stitched and braided, nappa cords, cords made of finest salmon leather, suede, printed leather, exotic leather lace and much more and in a huge selection of colors. They also have a the selection of jewelry findings that you can select for their leather. I often find one shop has the leather, but they don't have the findings. I love that they have both. I used one of the black Plessmann Endless leather cords and I threaded the leather cord through one loop, and tied it tightly in an overhand knot. You will lose a little bit of length tying your knot – but trim up your ends evenly so that you have about a 6-inch length of leather cord. Combined with the beaded connector you made, you will end up with a bracelet length of roughly 7 inches. 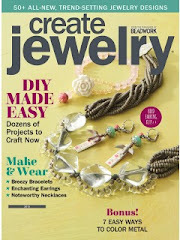 Finally, twist open a jump ring and connect a lobster clasp to the two holes in your end clasps. The lobster clasp will connect directly to the loop in your beaded connector. I followed the same directions for this flower and bee bracelet. I used some more of the black leather cord. 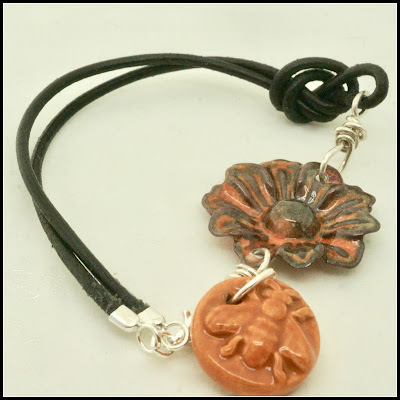 The orange and gray flower is enameled by GardanneBeads. 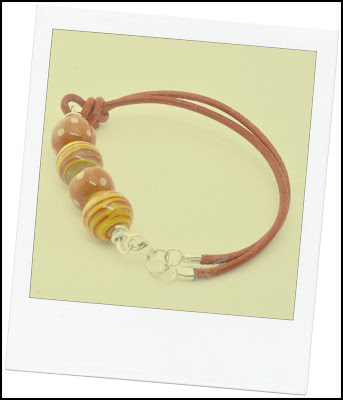 For the third bracelet, I used a luscious orange leather cord, with ceramic beads. I like each bracelet individually. but I love them together. If you love them, they are available for purchase in my online shop. What are your thoughts on the trio of bracelets and bees?